Ray Dalio formed Bridgewater Associates in 1975. Prior to this, he was Director of Commodities at Dominick & Dominick, a Wall Street brokerage house, and subsequently joined Shearson Hayden Stone, where he was in charge of the Institutional Futures Department. He graduated with an M.B.A. in finance from Harvard Business School in 1973. 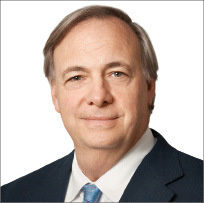 For over 35 years, Bridgewater Associates (www.bwater.com) has been a global investment manager and has pioneered several investment strategies, including currency overlay management in the ’80s, the separation of alpha and beta in the early ’90s, and inflation-linked bond management in the mid-’90s. Based in Westport, Connecticut with nearly 1,000 employees, Bridgewater began managing assets in its optimal alpha strategy Pure Alpha® in 1991 and its optimal beta strategy All Weather® in 1996. The firm manages approximately $74 billion in global investments for a variety of institutional clients, including foreign governments and central banks, corporate and public pension funds, university endowments, and charitable foundations. The Bridgewater culture seems to be so embedded in the principles of Ray Dalio and your core values. Will you talk about how you came by these principles and how key they are to Bridgewater’s success? My most important principle is that getting at the truth, whatever it may be, is essential for getting better. We get at truth through radical transparency and putting aside our ego barriers in order to explore our mistakes and personal weaknesses so that we can improve. I think that trading the markets at an early age had a big effect on my wanting to operate this way. In the markets, one can do a lot of research and still not be confident of being right and the costs of being wrong can be huge, so I learned not to be too confident. I liked having capable people challenge my thinking to help catch my mistakes so I could do better in the markets. I also learned that I had to think independently, because in the markets, if you think with the consensus, you will never make money. Going to Harvard Business School (HBS)reinforced this approach. The school I attended before HBS didn’t teach me the most important things that I needed to be effective and, in fact, taught me some bad habits. Most schools train students to remember what they are taught and then test them to see how well they remember the information. The students with the most correct answers are called smart and the ones with the fewest correct are called dumb. So, naturally, most schools teach kids to value memorization and to feel bad about not remembering. That approach is not of much use in helping people succeed in life. I believe that, in order to have a successful life, we have to decide what we want for ourselves and then figure out how to get those things. Most schools don’t help us learn to do that well. They don’t teach us the value of knowing what we don’t know and how to learn from our mistakes. Most schools treat mistakes as bad things and lead students to believe that smart people don’t make mistakes, but that’s not true. Everyone makes mistakes and everyone has weaknesses, so success in life comes from learning from our mistakes and figuring out how to get around our weaknesses. HBS was completely different. Cases were presented and we then had to figure out what we would do in each case. We would debate the merits of our different solutions in order to come up with even better solutions. So my HBS experience reinforced my core belief that independent thinking and debate is a good way to get at the best answer. I also think that meditation played an important role in influencing how I think. I know that it helped me be more clear-headed and creative. I learned to meditate when I was 20 and I noticed that most everything became easier after that. I started Bridgewater following that core belief, just two years out of HBS. At first, the entire company was just me and a guy I played rugby with. As Bridgewater grew, we always tried to seek out the real truth, without letting our egos be involved. I didn’t want to work with people who didn’t want to operate under these principles. While I believe individuals who are on their own can have any values they want, if they are working with others who have conflicting values, they are going to have problems. For example, while working for money is certainly part of most people’s desires, for me, it doesn’t compare to working to get at the truth so we can improve. If I had to work with people who would compromise truth and improvement for money, I’d be unhappy. Similarly, other people would be unhappy with me if they were only working for the money that I might pass up in order to get at the truth and to improve. So we have to be clear about what we value most and how we are going to act in order to live out our values together. I believe that values and principles have to be clearly articulated so that the people in the group behave in a way that is consistent with what they are trying to achieve. A lot of companies give a few bullet points about their vision and then just let everybody go about doing whatever they were doing. I think it’s important to be clear, which is why I wrote my principles. Since I want people to think for themselves, I asked everybody here to look at these principles and debate them. The vast majority of people here said they agreed with them and wanted to operate by them, so they have essentially become our constitution, but they’re not for everyone. While most people who are now at Bridgewater couldn’t work in an environment that isn’t radically truthful and transparent, other people find it terribly uncomfortable and leave. While radical truth and openness is healthy, it can be very uncomfortable for people whose egos bruise easily. If these principles were not written up, I think most people would find our environment uncomfortable and would not realize how healthy it is. While I wrote these as my principles in order to explain how I run the company, I’m not 100 percent sure that they’re right. They are what I believe are right and they have worked great for 35 years, but it is up to others to decide if they think they’re right or wrong for them. It is up to others who run the company after me to choose if they like them and want to operate by them. If the next group of people decides they’re stupid, that’s fine, though I highly recommend them. That is what this process of trying to figure out the best way to do things is all about. It would seem that it would be easy to convey those principles in the early days when you only had a few employees. Has it been more challenging to focus on the core principles now that you have such a large company? I’ve taken Bridgewater from a company of three people to a company of nearly 1,000. I found that we easily understood each other up to the point of there being about 50 people. From that point, until I wrote the principles three years ago, I found that the level of understanding declined. Since I wrote them, they have become clearer and more widely embraced than ever before. There are nearly 300 principles and, while not all of them are perfectly understood, everyone knows that people are expected to live in a radically truthful, open way. They know that we want people who believe that discovering what is true is good, no matter what that truth is, even if that means having to admit to one’s own strengths and weaknesses. Most of the people here believe that living this way is a good thing. Most people at Bridgewater believe in looking at their mistakes and knowing their weaknesses so they can figure out how to get around them. This is why we have grown and improved so quickly. The other principles are valuable but less important than this core principle. Operating this way gives us a great competitive advantage. In most other companies, people try to prove how good they are, so they hide their mistakes. As a result, they improve much more slowly. The political system is a classic example. A politician typically won’t admit he or she made a mistake because others will say, “I caught you in a mistake, so you must be bad” – that is a very naïve and ineffective way of looking at the world. Operating the way we do is scalable for the same reason that having a democracy and living a healthy lifestyle are scalable. If people believe that living this way is good, they will strive to do it and if they don’t, they won’t. You touch on money not being the primary goal, but with the success you’ve had, has it made it easier to push the principles? I am not pushing any principles; I am conveying what I believe for others to assess. Certainly the results of Bridgewater operating by these principles over the past 35 years are demonstrations of the process working well. In the early years, these principles seemed logical to me, but if I had been asked to show an example of them working, I would not have been able to because this theory had not yet been proven. Now, I can say with more confidence – and others can too – that this way of being works. People clearly see the connection between operating this way and our getting the things we want, so they are certainly more motivated than if they didn’t see that connection. Many of your principles are based on good common sense around truth and learning from mistakes. Does it surprise you that those aren’t looked at as the norm? No, it doesn’t surprise me because, as I mentioned, the opposite behavior is typically reinforced in schools and in most work places. It doesn’t come naturally to most people to be comfortable being completely open, to explore their mistakes and weaknesses, and to not mind saying they don’t know when they aren’t certain. All people who are new to Bridgewater take some time to adapt to it because they have never been around anything like it before. While I think it would be great if it was the norm, I understand why it’s not. You mentioned five distinct steps in your process. Would you give an overview of the process and how each of those steps is critical to achieving success? For me, getting what I want takes place in five distinct steps. First, I have to decide what I want – what my goals are. While I believe that most people can have just about anything they want, I know that we can’t always have everything we want. We all have to prioritize in order to determine what’s most important. These goals determine our directions in life. So setting goals is the first step. As one heads towards those goals, problems are encountered – that defines the second step. How we approach our problems has a huge effect on how well we progress toward our goals. One common mistake that most people make at this stage is they get emotional rather than remaining calm and analytical. They think their problem is a bad thing, because it causes pain, so they don’t make the most of the experience. If, instead, people would remain calm and realize that wrestling with problems is the exercise that strengthens and teaches us how to get around similar problems in the future, they could get a lot out of this experience. It’s impossible to get stronger without pain, so if we keep avoiding pain, we won’t get stronger. The second common mistake that most people make when they encounter a problem is that they try to immediately decide what they should do about the problem, and they skip the next two steps in the process. The third step is to diagnose the problem in order to, most importantly, find its root cause. This has to be done in a non-egotistical way because often, the root cause is a mistake that we are making which might be due to a weakness that we have. All people are born with strengths and weaknesses, and quite often the strengths come with weaknesses. For example, a very creative person can be disorganized. It is very common for people to not acknowledge their weaknesses because they have ego barriers. But that’s dumb and unproductive because everybody has weaknesses and, if we don’t acknowledge our weaknesses, we’re going to keep encountering the same obstacles over and over again. So the third step is to diagnose, as accurately as possible and non-egotistically, what the real root cause of the problem is. The fourth step is to design a game plan for addressing the root cause of the problem that is standing in the way so that it stops being an obstacle. For example, if you’re a creative person who is disorganized, you might hire a secretary to take care of your organization so it doesn’t become a problem. Once one completes the fourth step – in other words, after designing a way of getting around the root cause – one has to act on that plan. That is the fifth step. This step requires self-control or, alternatively, accepting imposed controls from the outside to help one do what is necessary. If you say you’re going to lose weight and have a good plan for achieving it – let’s say eating properly and exercising – the plan is no good unless you execute it. Those are the five steps. I have found that by doing them well, I, and others at Bridgewater, learn how to get what we want at a much faster rate. I also found that nobody is good at all the steps. But nobody has to do all those steps well because, if you know which steps you are weak at, you can get someone to help you with them – like the creative person who finds the disciplined person to help him. That, in brief, is what we are trying to do at Bridgewater. Maintaining that process in a company, especially once you reach a certain size, can’t be simple. How do you keep your people focused on it? By talking about these principles and operating by them. Most importantly, people have to want to operate by them. I don’t believe that I can make people do anything they don’t want to do. And I don’t want people who just follow orders. The most important communication I can have with people is to ask what they want, to make sure that it’s the same as what I want, and then to help them learn how to get it. I just have to make sure they are clear about the way we do things, and to ask them to either buy into this approach or to come up with a better approach which, of course, has to also work so that it can be self-reinforcing. Using the fitness comparison as an example, it’s easy to have a community of fit people if the individuals want to be fit and if the approaches the community uses work. Bridgewater was one of the early companies to raise the flag on some of the key issues of the financial crisis. Were you surprised at the speed and severity of the downturn, and are you optimistic we’re on the path to recovery? It’s my business to look at these things, and it seemed very obvious at the time that we were going to have this sort of crisis. Frankly, in 2006 and 2007, it was obvious to people who are paid to think about such things, who have common sense, and who weren’t swept away by crowd psychology, that lenders were lending money in vast amounts to people who had little prospect of paying it back. It was easy to calculate the banks’ losses by applying market prices to positions that were disclosed in their financial statements. It didn’t take a genius to see that losses of this magnitude would cause a credit crisis. In response to this crisis, the Federal Reserve and other central banks printed a lot of money to buy financial assets, which pushed financial asset prices up. Debt is a promise to deliver money, so when there is a debt crisis, it will feed on itself until the central bank prints money to alleviate it. That is what they do in such cases though, from the time of the crisis to the time this adrenalin shot kicked in, there were some nervous moments. To be clear, we aren’t done with our debt problems because we haven’t reduced our debts. The incomes and net worths of Americans and most major developed countries are lower than they were at the highs, and since their credit systems are not going to leverage them up as much as they did in the past, they won’t be able to spend as much as they did in 2007 for a long time. If the economy slips back down, I am pretty sure that the Fed and other central banks will print and spend even more money to perk it up. So I believe that we have entered a long period of very slow growth that will be bounded by the 2007 high and the 2008 low. For such a long term issue, is it difficult to be optimistic when you look at bringing strength back into the global economy? I believe that, in this generally challenging environment, there will be plenty of opportunities for inventiveness to occur and for people to be rewarded, as long as our incentive system is retained. And I do believe that it will be adequately retained, although I recognize that there is a possibility that policymakers could do harmful things or not be properly responsive in this environment of growing populism. The effectiveness of democracies is always tested during periods of economic stress. I think that we are seeing some signs of this now as our political process is not approaching our challenges in a thoughtful, collaborative way. But my guess is that we will pull through this challenge. What is the primary lesson that policy makers, companies, and private citizens should learn from our current situation as they search for ways to positively shape our future?